If you’ve been paying to each and every post on this blog, and if not, why not, you will have noticed that we recently featured the latest Christmas ad from British department John Lewis which featured Elton John reliving some gorgeously-moving festive childhood memories. People understandably were rally moved by it, and they responded by contacting John Lewis by Twitter. All lovely and wonderful, and bang on what the department store’s marketing team were no doubt a-hopin’and a-prayin’ for, but guess what folks? You were tweeting the wrong John Lewis. 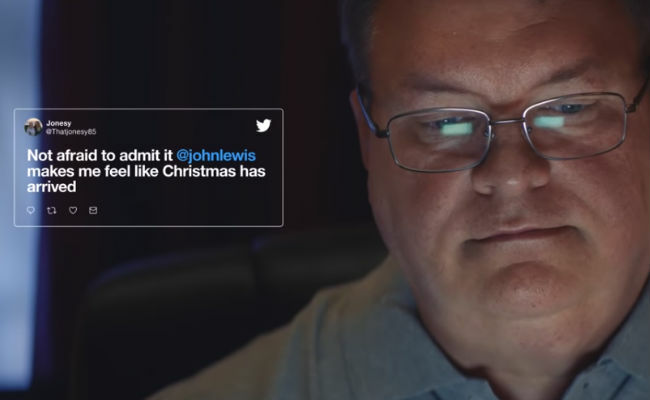 Fortunately, the real John Lewis, from Blacksburg, Virginia, is an all-round nice guy with a great sense of humour who handled the mistaken social media identity beautifully, so well in fact that he inspired Twitter UK to have gentle fun with the whole thing. Below are some of the tweets and responses from John Lewis who should definitely be the actual face of the department store next year.